A sliding door splits a woman’s life into two time-lines: in one she misses an underground train, in the other she catches it. This is the starting point of the romantic comedy Sliding Doors from 1998. My experience was somewhat different. I don’t usually break the law, but there are laws, and then there are laws. I mean, the law against committing murder is hardly of the same dignity as the one against crossing the street against a red man. I’m not even sure if the latter is really a law here in Belgium – though you’d think so. Perhaps (as in Sweden) it’s just custom that keeps Belgians standing at the curb-side waiting for the lights to change. Either way, crossing against a red man is something I do weekly, while I’ve never killed anyone – and I hope I never will. 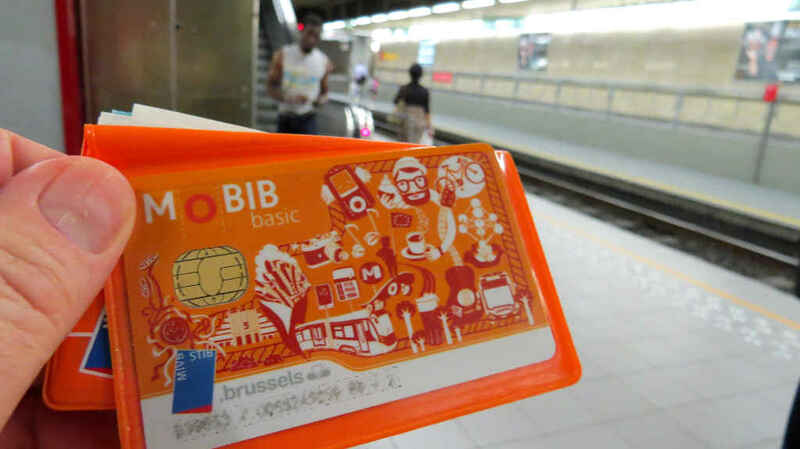 Through June I was using what Brussels Transport calls a “jump card”. It’s an electronic passcard that you can load with five or ten journeys at a time and use to get about on the trams, the buses and the metro. I wanted to see whether it was cheaper for me to use this than to buy a season-ticket like Mrs SC. Unlike her, I’m not travelling daily on public transport. A couple of Wednesdays ago I hopped on a tram to go up to town to meet Mrs SC after her day at work. I only realised when I was on the tram (when I registered my jump card) that the card had expired. From the sensors in the trams, you can’t tell how many journeys you have left. I mean, it’s probably intended you should be able to read the information off the little grey display attached to the sensore, but I can’t. The screen is set too low and there’s too little contrast on the display. However, the machines will pling to tell you your journey has been registered or buzz to tell you your card is empty. I try to keep a countdown in my head, but I was surprised when the machine buzzed at me. I’d obviously lost count. My final destination was the Rogier metro stop. Here two metro lines, two pre-metro lines and two tram lines all meet and cross one another. For Brussels it’s quite a major interchange. 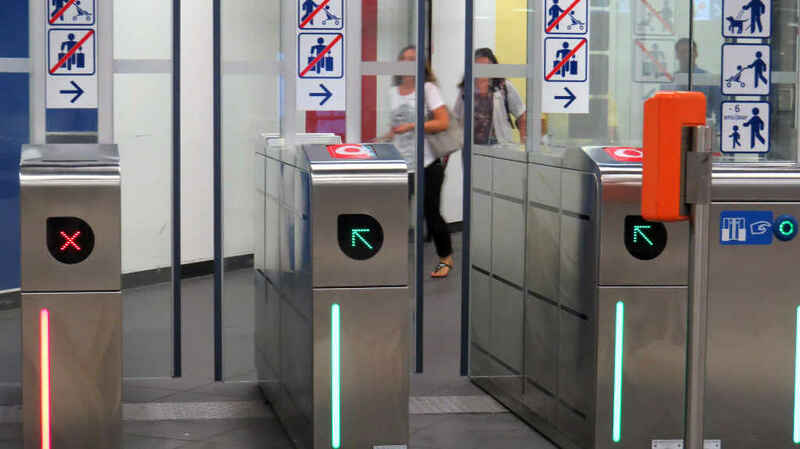 There are three levels, a large central hall on the middle level and numerous exits… And no way to get out without passing barriers where you have to show a valid ticket. 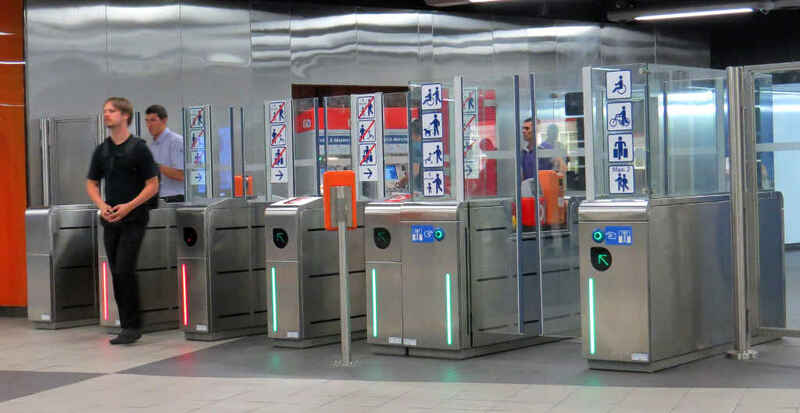 The barriers are not waist-high turnstiles like in London or Stockholm, they are man-high sliding doors. They open and then close with the speed and viciousness of a guillotine. I saw how some miscreants pushed behind people who did have a valid ticket, slipping through before the doors shut. But I also saw how you had to be pretty quick – and close up against the person you were following. And I simply didn’t have the brass neck for that. Instead I wandered around inside the station looking for a ticket machine. The only ones I could see were all on the wrong side of the barrier. There were also threatening signs directed at people travelling without a valid ticket. In the end I phoned Mrs SC, who was waiting for me above ground, and got her to come down and let me out. A part of me was thinking of security cameras and how we’d surely been identified and would soon be scooped up by the transport police. Another part was saying: Take it easy, this is Belgium, not Singapore, and quite enjoying the adventure. My side hurt though. We still had to get home. We re-entered the station another way. Now on the right side of the barriers, I loaded my jump card and we walked through like law-abiding citizens. I wondered a little what went through the heads of the authorities when they set up the system at Rogier. (It’s similar in several of the other intersection metro stations. I’ve been looking.) The system is clearly designed to punish rather than teach. Not putting ticket machines inside the barriers at the stations makes it impossible for travellers who’ve made an honest mistake to put the situation right by buying a ticket at the end of their journey. It’s what I would have done. I originally published this article on the separate Stops and Stories website. Transferred here with a little polishing for SEO and a new featured image 8 August 2017. I recorded the original version – with sound effects – and published it on Soundcloud. I’ve taken that down now.